The eldest son of Reverend Stephen Long Jacob, he was born 29th January 1800, baptized 5th March of that year, and died at sea 11th February 1824. Little is known about him. There exists a letter written to his brother Herbert Jacob in India by eleven correspondents, all on one sheet of paper, and of whom he was one. There are two postmarks on the letter dated September 4th 1823. It offers some information on the family,who would appear as children at least to have been very close; I reproduce Edward's contribution below. We are once more nine together and want only you to complete the circle, but as you are not comeatible all we can do is to join in a paper communication with the absent one "a la distance". Philip and George had been at home but gone back to Exeter before I came, but they are come again to be a few days yet with me. I have been here a week and am staying a few days longer only, as the ship is soon to be ready for sea again. She has been two months at Portsmouth but I could not get leave before. Nobody yet knows what is to be our next voyage but it is not likely to be a long one as all ships are now usually paid off after 3 years service, and the "Glasgow" wants but a few months of her time. We have dismal weather, nothing but rain, rain and there has in fact been no summer this year, but we have notwithstanding lots of fruits. I have not been able to enjoy myself so much at home this time as before as I have not been well ever since we came to England and am so weak and reduced that I cannot exert myself as I used to. The change however, will do me more good than an ocean of physic. Altogether we have been pretty gay. The Bridgewater races were this week. I did not go them, but Phil and I went went to the races Ball for Bridgewater had a very good one. Last night we were at a party at Miss Fields but had only stupid card playing. Tonight we are to be at one of Dr McMallen's, which I hope will be pleasanter. I think Bridgewater is improving and not quite so dull as it used to be. The place at home here is looking very fresh and nice but the rain keeps us very much shut up in doors. There is not much alteration at home, Sophy is a little taller but Phil and the rest are much as they were except George, who is much grown and very strong and active, he promises to outstrip us all. I suppose you have grown a little taller send us word what your height is. We have been much vexed by seeing in the Bath paper yesterday that it is intended to make a reduction in the Military Establishments of Bombay and Madras, and to augment in Bengal, which will be very provoking on your account, but I hope it's not true. I was very fortunate with my things this time, as I lost two China crepe dresses each for Mary and Sophy that I bought in Calcutta, which with some other things of less consequence were most provokingly sezied by those confounded Custom House Jackalls. I saved with some difficulty a shawl for our dear mother and three pieces of handkerchief and some few trifles but, experientia donet, Mine has cost me dear and another time I shall be awake to the business. August 31st. Yesterday evening came the unwelcome summons to rejoin my ship as she is about to sail but wither I am yet ignorant. The same post however brought a much more agreeable despatch from you of April last, which afforded general pleasure. We have been longing to have a letter from you while I am here and this came just in the nick, and was the more welcome as it seems so pleasantly written, and to give a more comfortable account of yourself than before. The sentiments and principles which it expresses, my dear Herbert, delighted us all much. I hope none of the inconveniences you apprehend will be produced by applying about your rank you do not say if you have any more steps, but I hope you are a Lieutenant by this time. If you are 5 feet 8 you are just on par with Phil and must have grown 1 inch and a 1/2 since you left home. George is about 5 fr 6 and growing fast, he returned to Exeter last week, I was very sorry to lose him but he was obliged to go on account of an impeding examination for a prize in which we hope he will be successful. Phil goes the day after me. We have at last some summer weather, today is delightful. We have greater abundance of fruit this year than ever. Dear Father takes this year the Tithes in kind himself so that we are more than usually interested in the Harvest, which is not however very favourable. I am sorry I have not room to write any more. Farewell dearest Herby and believe me ever your warmly affectionate brother and friend Edward. The fourth HMS Glasgow was built in 1814 and was armed with twenty-eight twenty-four pounder guns. She was built as one of forty ships to counter the large and powerful United States frigates. The war soon ended, but not before the Glasgow was rated as one of the best gunnery ships in the Navy. 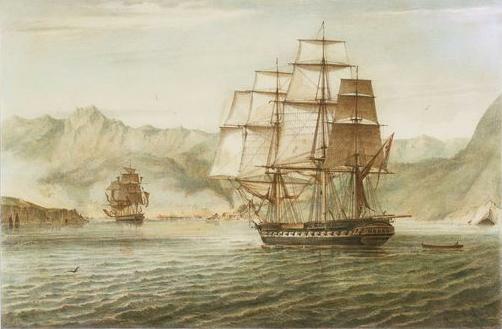 In 1816 she took part in the bombardment of the Bay of Algiers for which she received a Battle Honour. It is clear from other's contributions to the above letter that Edward was unwell in August 1823. He died on 11th February 1824; I do not know of what as yet.